By Simon Dumenco . Published on October 25, 2018. What people are talking about today: Ad Age editors and reporters are on the ground in Orlando, Florida, to cover the annual Association of National Advertisers Masters of Marketing conference, which really starts hopping today (following some Wednesday afternoon sessions, a dinner and a performance by rock band Train last night). McGarryBowen registered 13 people, including founder Gordon Bowen and Chief Creative Officer Ned Crowley. Leo Burnett, by contrast, only has six people here, and DDB has only one person listed, as does 360i. By contrast, Deloitte, which like other consultancies is pushing onto ad agency turf, has 28 people attending representing its various divisions, including Deloitte Digital. Keep reading to find out what sorts of contingents various digital giants (including Google, Facebook and Twitter) have sent to Orlando. The news hits home: The journalists at CNN became part of the story on Tuesday. Staffers at the cable network's New York City bureau were forced to evacuate after the discovery of a "suspicious device" that arrived in the mail, following multiple bomb scares involving prominent political figures around the country (with more coming later in the day). CNN tweeted an image of what the New York Police Department called a "live explosive device" along with the mailer it came in, as well as a shot of the "total containment vessel" used to take it away. Summing it up: If you've had a hard time keeping track of this developing story, Vox offers an explainer: "Explosive devices sent to Clintons, Obamas, CNN: what we know." Dig in: "McDonald's admits it's losing market share at breakfast and now it's trying to woo diners with a decidedly not-low-cal trio," Jessica Wohl reports in the latest Ad Age Marketer's Brief: "Triple Breakfast Stacks have two sausage patties, two slices of American cheese, bacon and an egg, and can be served on a McMuffin, biscuit or McGriddles 'cakes,' as the company calls those syrupy-sweet sandwich rounds." 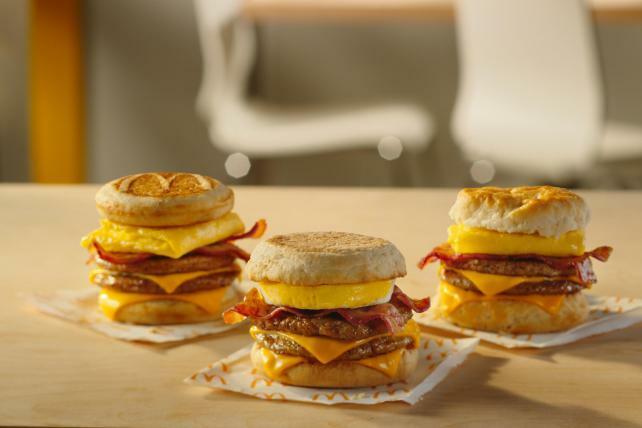 McD's locations across the country officially start serving the limited-time breakfast feast on Nov. 1. It takes two: "Snap has hired two executives to take on the responsibilities of departing Chief Strategy Officer Imran Khan, adding technology-industry veterans to help bulk up its advertising business and build partnerships," Bloomberg News reports. They are Jeremi Gorman, formerly head of global advertising sales at Amazon, and Jared Grusd, who was CEO of the Huffington Post and previously worked at Spotify and Google. The one-stop marketing shops: "Adobe has long held kingpin status among marketers with its cloud services," Ad Age's George Slefo writes, but the world is rapidly changing, with Salesforce "encroaching on Adobe's business-to-consumer turf" and Adobe itself making an aggressive move with its $4.75 billion acquisition of Marketo last month. The bottom line, Slefo says, is that "both Salesforce and Adobe are pitching themselves as ideal one-stop-shops where marketers can tackle all their needs under one roof. That isn't the case today, but it's where both companies say they're heading." Amit Ahuja, VP of ecosystem development at Adobe, tells Slefo that "everything is turning into a subscription business, where the consumer is either going to stick with a brand or switch to a competitor." Read more of his insights here. A clear Signal: "Here's what NBC's streaming news channel will look like," according to Ad Age's Jeanine Poggi. Blame the tablets: "AT&T posted a surprise loss of subscribers last quarter," Bloomberg News reports. Game on: "Everything you ever wanted to know about Twitch but were too afraid to ask your 13-year-old," writes Matthew Gardner, a co-founder of Highfield, in an AdAge.com guest post timed to TwitchCon ("a celebration for Twitch creators and their communities"), taking place Oct 26-28 in San Jose, California. Gardner starts by tackling the question "Why watch someone else play video games?" From print to web to storefront: New York Magazine's shopping-focused Strategist vertical is opening its first IRL (in real life) retail pop-up shop just in time for the holiday season. It'll have a seven-week run in New York City's SoHo neighborhood starting Nov. 8 and will focus on lifestyle items ranging from skincare products to bed sheets. A big-picture view of the midterms: As of Tuesday night, Nate Silver's FiveThirtyEight is forecasting that Republicans have a 5-in-6 chance of keeping control of the the U.S. Senate while Democrats have a 5-in-6 chance of winning control of the House. Time's running out to get your ticket: Ad Age Next, our must-attend event examining the future of marketing and technology, is happening Nov. 13 and 14 in New York City. Find out more here. And finally, our Creativity spotlight: "Fried chicken fast-food chain Popeyes opened its newest drive-thru, in Fort Stockton, Texas," and it's rather elaborate, Ad Age Creativity Editor Ann-Christine Diaz reports. "The process of ordering grub begins in the Lone Star State at the drive-thru's menu board, but the pick-up window is a 12-hour road trip away, at Popeyes' flagship location on Canal Street in New Orleans, Louisiana. ... The stunt, created out of GSD&M, highlights the 12-hour marination process Popeyes' chicken undergoes before it gets to your table."